Last week Croisières de France announced that it would be acquiring Celebrity Cruises’ Century for the French market in 2015, both companies being Royal Caribbean brands. So this week we have a quick look at the French cruise market for any further prospects of growth. 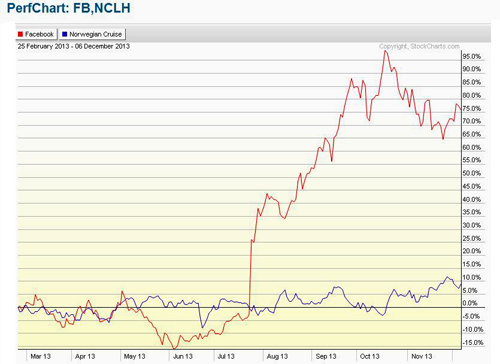 Meanwhile, as Norwegian Cruise Line has announced the sale of 22 million new shares, we revisit our comparison of NCLH and Facebook share prices. And MSC Cruises confirms that Fincantieri Palermo will lengthen all four of its MSC Lirica class ships to 902 feet. 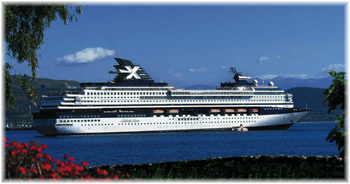 Last week the announcement was made of the largest ship to join the French passenger fleet since the s.s. France was taken out of service in 1974, with Celebrity Cruises’ trend-setting 1,814-berth Century following her two former fleetmates, the 1,442-berth Horizon and 1,340-berth Zenith, into the fleet of Croisères de France in 2015. 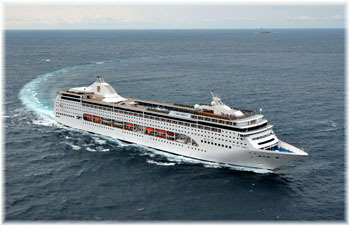 Equipped with 314 new balconies in 2006 (a move that was also adopted by TUI Cruises after they bought her two sisters), the Century has been popular in the North American market, where she has sailed both in the Caribbean and to Alaska, as well as in Australia, where she has also traded in more recent years. The transfer of the Century will hopefully promote a resurgence of cruising in France, which has been almost the last nation in Europe to join in the upsurge of going to sea for a holiday. Crosières de France aims to achieve 55,000 passengers this year, 100,000 in 2014 and 120,000 in 2015. Part of this will include new offers of Baltic and Norway voyages for French passengers as well as a doubling of winter Caribbean offerings for the French market on the Horizon. New cruises will make calls in the UK and overnight stays will be added to some itineraries at Venice and Amsterdam. While not a particularly large cruise ship these days (she was the 143rd in the world by length overall at the end of 2012), the Century is still larger in tonnage than the s.s. France, the pride of the French passenger fleet in an earlier era. Her arrival will add another 474 lower berths to CDF’s inventory and even if the fleet remains at two ships will still mark a 17% increase in capacity for CDF. Should the French cruise market continue to grow, with no more Century class ships available when another ship is required, it will be an interesting to see whether it might be a newbuilding, as in the case of TUI Cruises, or whether the Zenith might return or one of the Millennium class ships acquired instead. At the same time, earlier this year the 27 members of l’Association Française des Compagnies de Croisières joined the Cruise Lines International Association to become CLIA France, which reported 481,000 French passengers in 2012, a 9% increase, compared to 12% in 2011. Of this number, two-thirds took a Mediterranean cruise, and 12% took a Caribbean cruise, the latter being an increase of 37%, largely made possible by new offerings from CDF, which reserved 500 berths per sailing of the Horizon for French Passengers, joined by French-Canadians and Spanish passengers from Pullmantur. But there remains a long way to go yet before the French market, with a penetration of only 0.7%, becomes anywhere near as important as its neighbours over the border in Italy and Spain (both at 1.5%), or its northern neighbours in the UK (2.7%) and Germany (1.7%). Is it really a case, as remarked by one Frenchman last week, that “the French do not travel well”, or is it a case that, although France deep maritime tradition, the right formula has not yet been found? Whatever the outcome, Croisières de France is a Royal Caribbean brand so it will be interesting to see how Carnival Corp & PLC reacts to this latest move. In recent years, Carnival’s growth in the French market has been primarily achieved by putting French passengers on board Costa ships at Marseilles, but Costa is an Italian product, not a French one. 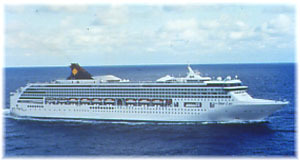 There have also been a couple of desultory efforts to revive the Paquet Cruises brand, owned for some years now by Costa, but as this was done with Spanish and Italian-market ships, the French did not seem to support the cruises enough to allow Carnival to be able to revive a distinct French brand. 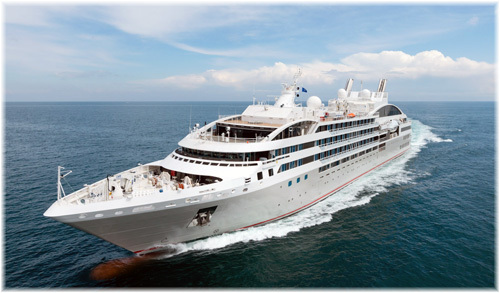 The other major participant in the French cruise market is of course Compagnie du Ponant, which operates three new mega-yacht-styled vessels, the 264-berth Le Boréal (2010), L’Austral (2011) and Le Soléal (2013) and has on order a fourth sister ship from Fincantieri for delivery in 2015. These ships also participate in the lucrative adventure market, with sailings in Antarctica and across Canada’s Northwest Passage. With four of them, these ships will offer a total of 1,056 berths, or about a third of the berth capacity of Croisières de France. However, when one takes into consideration the fact that the CDF ships operate seasonally, with some going back to Pullmantur or on charters in Brazil in the winter, Ponant are probably closer to offering about half the capacity of CDF, but in a much more expensive market. Compagnie du Ponant has been owned by the UK-based equity company Bridgepoint since last year. Last week, Norwegian Cruise Line Holdings (NCLH) announced a 22 million-share secondary offering by Star NCLC holdings Ltd (Genting Group) and affiliates of Apollo Management LLC and TPG Global LLC, at a price of $33.25 per share. Sellers have also granted underwriters a 30-day option to purchase an aggregate of up to 3.3 million additional shares, agreeing to sell up to 25.3 million shares in NCLH. This step advances the company a step closer to being able to make a secondary public offering. Between June and September this year, Facebook’s share price doubled. Although it has tailed off slightly since, its value has stayed well above that of NCLH for the last few months. The increase in the Facebook share price, at slightly more than two-thirds, has come about largely because it has discovered how to use advertising effectively. The NCLH share value has also increased, although by only about a fifth, with the introduction of further economies of scale with its 4,000-berth Norwegian Breakaway from New York. Norwegian Cruise Line used its own Facebook page to conduct a naming contest for its next two 163,000-ton newbuildings, two 4,200-berth Breakaway Plus ships set to debut in the autumn of 2015 and spring of 2017. Out of ten potential names on which Norwegian sought votes, the winners, announced in October, were Norwegian Bliss and Norwegian Escape. As we first advised in The Cruise Examiner on November 4, MSC last week confirmed that four products of what is now the STX France shipyard at St Nazaire, the MSC Armonia, MSC Lirica, MSC Opera and MSC Sinfonia, will be lengthened by 24 meters, or 78.7 feet, thus bringing their overall length to 902 feet. Fincantieri Palermo, a yard that has done much updating work on MSC ships, will lengthen all four ships and plans include new 200 cabins and a new restaurant, while many new balconies will also be added. At 902 feet by 94 these ships will become real “pencils,” with a length to beam ratio of 9.57. By comparison, Queen Mary 2 and Europa 2, both ships that were built in the same shipyard as the four MSC ships, come in at 8.4. The MSC Preziosa class comes in at 8.8, which is the original length-to-beam ratio of the Lirica class. And the Seven Seas Mariner, another product of St Nazaire, comes in at a beamy 7.5. The only other ships that approach the length-to-beam ratio are the Norwegian Jade class, which was based on a design for Star Cruises that called for speed across long distances in the Pacific, is 9.1 length-to-beam. So are the Carnival Spirit class, streamliners of the Carnival fleet. At the other end of things, most of the Princess fleet tends to be beamier, at about 7.2 to 8.1 beams to length. Carnival ships also tend to be pudgy, with the Carnival Conquest class measuring 8.2 beams to length, the same as the original Carnival Fantasy class. 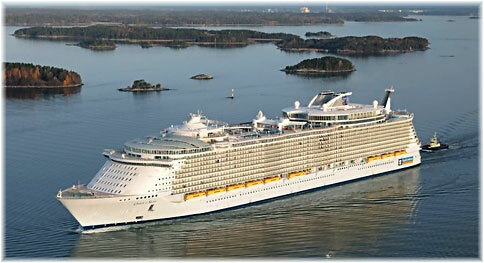 Beamiest of all, however, are the Oasis and Allure of the Seas, with 7.7 beams to length. At 883 feet x 93, that most famous ship from the movies, White Star Line’s Titanic and her sister ship Olympic, which served faithfully until 1935, were also “pencil” ships, with a length to beam ratio of 9.5. The lengthened MSC ships, however, will now exceed these dimensions.